These types of old sheds (this one is in Côte-Saint-Paul) used to be everywhere in the Southwest, including the backyard of the duplex where I grew up. It's nice to see one so well preserved. But they are notorious fire-hazards. Ce type de vieux hangar (celui-ci à Côte-Saint-Paul) était auparavant tout partout dans le Sud-Ouest, y compris la cour du duplex où j'ai grandi. C'est bon de voir un si bien conservé. Mais ils sont considérés comme des pièges à feu. 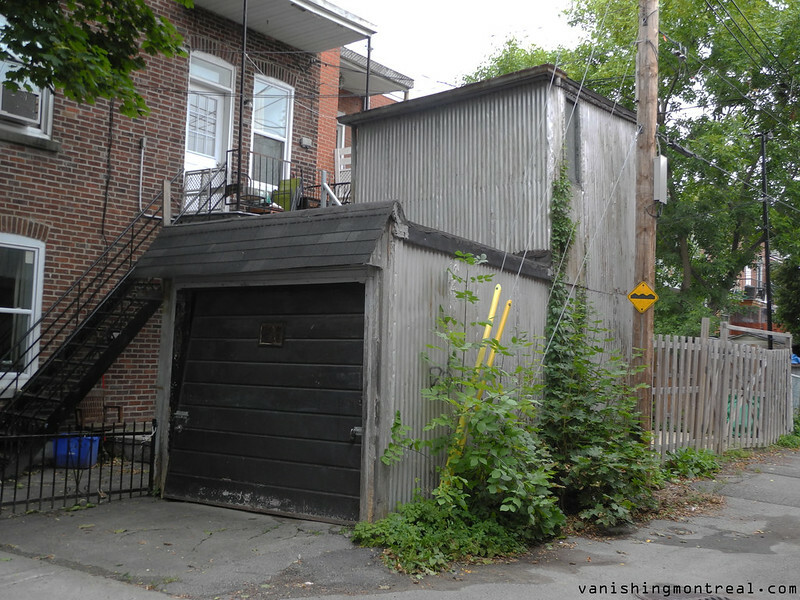 It's weird: when I was growing up and someone from outside Montreal would talk about 'sheds', I'd immediately be thinking of corrugated metal and tar paper fire traps attached to the buildings (I think I'd have considered this a detached garage rather than an actual shed). It never even occurred to me that 'sheds' could be things like garden or pottery huts in someone's backyard. Then again, maybe I just didn't know anyone who had these huts when I was that age... . Even now, decades after leaving kidhood and not being in Montreal, I still picture the two-storey metal self-made storage unites whenever someone mentions 'sheds'. It's amazing how regional or local someone's vocabulary can be.